Remembering The Day James Brady Was Shot : The Two-Way An NPR newscaster who was working for AP in 1981 recalls having to argue with her editors about whether to report that Brady had been killed in the assassination attempt against President Reagan. 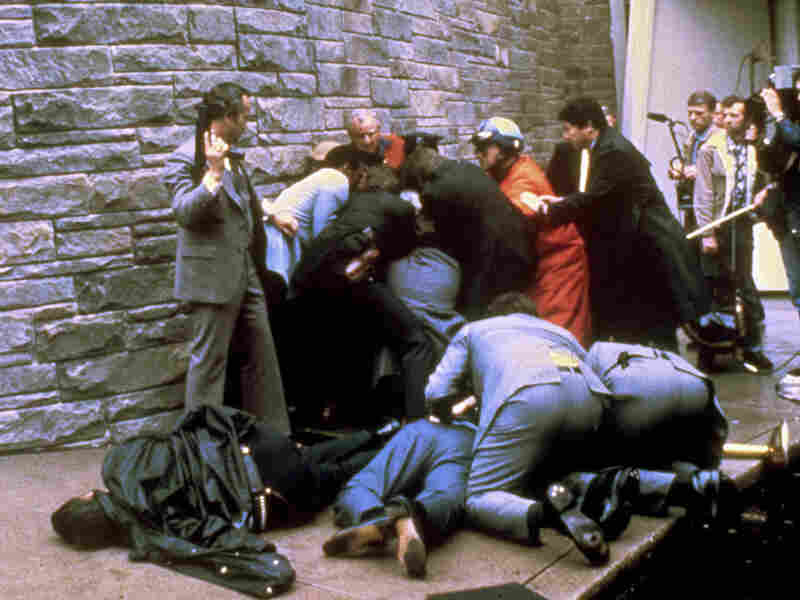 A Secret Service agent with an automatic weapon watches over James Brady after an attempt on the life of President Ronald Reagan, March 30, 1981. James Brady, the former White House press secretary, died Monday. Louise Schiavone, an anchor and reporter for our Newscast unit, recalls covering his shooting. It was a gray day, and by the afternoon, a steady rain had begun. I was a reporter-anchor-utility infielder at the AP Radio Network. That Monday, March 30, was my day off. I was having lunch in Georgetown at a terrific little bar, Mr. Smith's, with a friend and classmate from the Columbia University journalism school. A flash moved across the television at the bar that President Ronald Reagan had been shot. Basically, my friend ordered me to call in — which I did. I called the AP Radio desk to tell them I was 10 blocks away from George Washington University Hospital, with gear. What would they like? We agreed I'd run down there and see what was happening. By now, there was a drenching rain. Andrea Mitchell from NBC soon joined us. But the White House press corps was up Connecticut Avenue, at the Washington Hilton, scene of the shooting, unable to move. Speakes told us that President Reagan and Jim Brady were in the hospital, under the care of doctors and surgeons, and that both were still alive. With the first radio tape of a White House official on the shooting, I ran across the street to a little medical-uniforms shop to feed it to the desk. The people at the shop were very kind, as well as mystified, when I unscrewed their telephone to attach the alligator clips and move sound and voice material from my huge Marantz tape recorder to the desk. At the hospital, an auditorium had been set up for reporters. It was filling rapidly. No one had the technology we take for granted today — no cellphones, email, Twitter, nothing! Journalists filed from a bank of pay phone booths at the back of the auditorium. We all just had to wait our turn. And it seemed, by the availability of at least one phone at any given time, reporters were waiting for information they could trust before they filed additional material. Every so often, a doctor would go to the podium and brief the dozens of reporters who had gathered. Every briefing began with the questions: Is President Reagan still alive? Is Jim Brady still alive? In addition, there were doctors milling around the halls where we were also wandering about. Some took questions and answered obliquely. Journalists knew the fates of the shooting victims rested in complicated surgery that was bound to take hours. That was the best we had. In one of many calls (from the pay phone) to the AP Radio desk, I was asked to file on the death of Jim Brady. "Really?" I asked. "Who is the source?" Well, it appeared that CBS had a congressional source who said Brady was dead. "And their other source?" I asked. I remembered the first time I met Jim Brady, in 1981. He was standing in front of Blair House on a bitterly cold Inauguration Day, corralling reporters. What a charming, handsome, witty, vibrant man. A few years later, as a member of the board of the Senate Radio-TV Correspondents Association, I had a chance to sit next to Jim Brady at the head table of our annual dinner. The man now sitting next to me bore the scars of his gunshot wound. The scar and the plate on his misshapen skull, clearly visible. Brady's speech was slow and a little slurred. And while he clearly yearned to deliver the sparkling repartee for which he had been well-known, his wounded brain would not cooperate. Despite his tremendous trials, my final recollection of Jim Brady was that he was charming, he was lovely, and he was loved. And he knew it.